Can't decide which of TenRen's fine herbal and spice tea bag products to order? 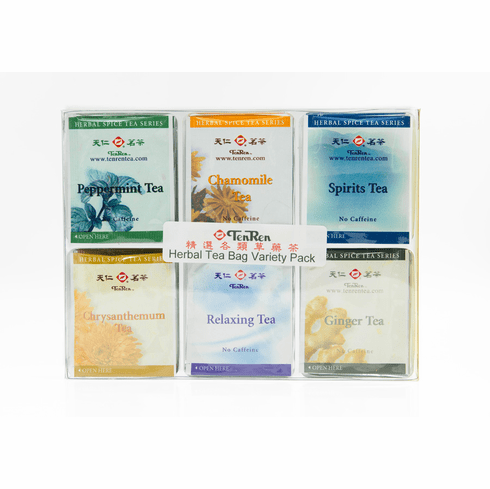 TenRen's herbal and spice variety pack lets you sample six of our fine herbal tea bag products. You will receive five Chamomile tea bags (caffeine free), five Chrysanthemum tea bags, five Ginger tea bags (caffeine free), five Peppermint tea bags (caffeine free), five Relaxing tea bags (caffeine free), and five Genmaicha green tea bags for a total of thirty tea bags for your enjoyment pleasure. Available in boxes of 30 bags. Shipping weight is 0.26 lb.Temporarily Out of Stock.